Matthew Tucker focuses on Technical Business Development at Rakem (part of the Rakem Group). Matt joins Rakem from Tasmania, Australia where he gained degrees in synthetic and theoretical chemistry and has undertaken research in these fields at the Australian National University, University of New South Wales, and University of Tasmania. 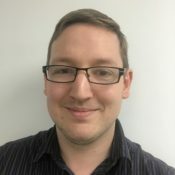 Specialising in radical curing chemistry, and working closely with Dymax, Matt aims to find solutions for common problems in the coatings industry. Coming from the sales team Matt has a great understanding and experience of various applications, including inks, protective coatings, and 3D Printing.